The Evo2 LED pool lighting system combines many unique features resulting in a spectacular, ultra reliable lighting system that is user friendly and easy to install. Evo2 LED lights are avaibale in either fixed colour or multi-colour options. The fixed colours are white, blue or green - the multi-colour option features AquaQuip's unique Colour Selection Palette which provides an almost limitless variety of colours possibilities and vast array of pre-programmed scroll and flash modes. The "flushest" pool light on the market! Evo FG Flush Mounted Lights are suitable for all fibreglass and above-ground vinyl pools. They are simple to install and fit through a 60mm hole. 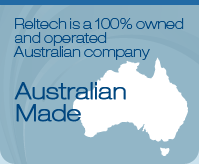 Competitively priced and Australian made. 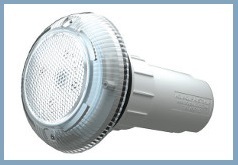 Low profile, compact niche light, supplied with 20mm cable. Evo FG Flush Mounted Lights - suit all fibreglass and above-ground vinyl pools. They are simple to install and fit through a 60mm hole. 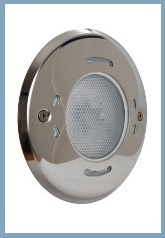 Low profile, compact niche light, supplied with 20mm cable. 1.2 metres of cable is factory fitted into the niche, allowing the light to be installed below ledges for maxium pool illumination. Super bright, energy efficent, long life. Upgrade your existing pool lights to LED technology without lowering the pool water level or changing the ransformer. Fixed Colour LEDs: The advantage Spectrum IX technology allows the user to program their favourite mode. 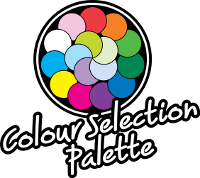 Choose from a variety of scroll and flash modes or program your own favourite default colour by selecting from the innovative Colour Selection Palette Mode. 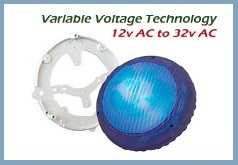 Variable Voltage Technology allows LED Retro-Fit lights to be operated from voltages between 12v AC to 32v AC. 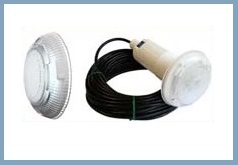 QC Series Mounted Retro-Fit lights are able to convert the following brands in concrete pools. Equip your new concrte pool with amazing LED lighting technology. Choose from either 20 metre or 30 metre cable length. 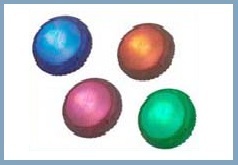 A variety of Pool and SPA Lighting to suit most ranges of Pools and SPAs.